What’s my “secret to success”? Find out what I told a room full of women. Not guilty verdict in Castile case? Another reason I am a recovering attorney on a mission. So how did I come up with this event? Well, I had an opportunity to attend a blacks in tech networking event in Atlanta in May of this year. I expected there to be up to 100 blacks in tech at the event. But when I entered the room, there had to be almost 1,000 blacks involved in tech! Imagine my shock and excitement at the same time. The purpose of the event was to talk about the Atlanta black tech scene and how to move forward for creating better opportunities. After I heard presentation after presentation, while the suggestions were good, I realized there was something that was missing: policy. To be honest, for whatever reason, policy seems to almost ALWAYS be missing from the conversation whenever an industry in the black community wants to discuss change. Something had to be done to underscore the importance of involving policy makers in tech change. Luckily, I had to the ability to do something about this. And so I set to work. NOTE: I had NO money, NO volunteers, NO co-chair, NO venue and NO way of knowing how I was going to pull this off in May of this year when I came up with this event so let me take the time to say THANK YOU to not only the planning committee, but each one of the sponsors that took a leap of faith to put their trust in me for this 1st time event. I was lucky to have been just featured in a Huffington Post article by Mr. Rodney Sampson, who is one of the most politically active technology personalities I know in Georgia. In this article, he listed 25 people best positioned to scale Atlanta’s growing inclusive technology ecosystem. I thought to myself that these individuals should form the Host committee for this historic event. No vetting necessary! I was off to a good start! After some discussions with Rodney, he accepted my offer to become Co-Chair for this event. His participation was VITAL to it’s success. I can bring the policy makers to the table but if there is no tech credibility behind this venture in the black tech community, it’s dead on arrival. So what you ended up having for this event is a leader in state policy and a leader in tech joining forces for to advance the black tech ecosystem here in Georgia through policy. This conference was well on its way. So I booked Nov. 8th for use of the Georgia State Capitol House Chambers, appropriations room, South wing and 2 of its largest rooms. I was ready to go! Here is the ugly truth, pure D.K. style: There are those that were scared and did not want a bunch of black people at the State Capitol. Period. End of story. Nothing can change my mind about that. And they had a reason to be scared; there is POWER in numbers and 30% of Georgia is black. And we were coming with specific, policy requests from influential technology leaders in the state. I was ruffling some feathers…as I tend to do at times. Just when you thought an abrupt change in location would be the only catastrophe that happens when planning an event, there was more in store. ANY and EVERYTHING that could go WRONG with a conference, went wrong with this one. Ladies and gentlemen, I am NOT exaggerating. And although I have planned literally thousands of events, all with their own hiccups and problems, this conference has specifically prepared me to take on ANYTHING I may encounter for future events. And for that reason, I “count it all joy” each of the problems below. I had a large sponsor who tried to get out of sponsoring, i.e. paying the money, for the event at the last minute after almost 2 months of promoting and expenses incurred. Luckily, that was resolved rather quickly. I lost members of the planning committee. When I say “lost”, I mean they either decided that they could no longer participate or were removed from the committee. We went from 26 people who wanted to “help” to 10, the “Talented Ten”. My standards of execution, even if on a volunteer basis, are remarkably high. I don’t do mediocre. I had a caterer charge my credit card for an amount I didn’t authorize and having to wait days for it to credit back to my account. Ultimately, we went another more FABULOUS caterer. The program and policy proposals had to be updated several times due to unread emails and misunderstandings. This cost us time and money—neither of which we had much to spare as a planning committee. We eventually got it all worked out. I have never had an event where I have experienced every type of emotion there is to experience: happiness, sadness, excitement, anxiety, frustration, anger, delight, and everything in between. It was quite a learning experience—-but keep reading! It was well worth it. In the end, we did it! Call to Action: We are not done! What I told attendees at the conference is what I am telling you all reading this: We are not done! The conference was only the beginning—policy proposals are one thing; getting them introduced and passed are a whole DIFFERENT ballgame. We need your continued involvement to see positive change in the state. I invite you to sign up for my enewsletter and to join the Facebook group to stay informed about what is going on from blacks in tech from a policy perspective. I will also upload future pictures from the event and video once available. Additionally, I have developed a follow up “Day of Action” and on the same day a Communications & Tech Symposium, hosted by the Georgia Legislative Black Caucus. These are two (2) separate events so if you would like to attend BOTH, please separately register for BOTH. I hope to see you Feb. 6th under the Gold Dome! THANK YOU to everyone that made this historic event possible. And certainly a big THANK YOU to the sponsors and even more THANK YOU to the planning committee, all of whom you can see their pictures and some bios on my webpage. As we look ahead to the 2nd Annual GA Blacks in Tech Policy Conference, I could not be more excited about making the conference BIGGER and BETTER in 2018. You can always visit my webpage for opportunities to join the planning committee or to sponsor next year’s event. I hope to see you all under the Gold Dome in the fall of 2018! I am Chief Diversity Activist and Consultant of Kendrick Advisory & Advocacy Group, LLC. We curate and execute customized initiatives, programs and events for organizations to meet their specific diversity & inclusion objectives and provide results. Visit us online to request me as a speaker, set up a time to chat about your diversity goals or view upcoming events. I practiced private securities law for over a decade before this transition to more meaningful work. I was featured in the Huffington Post as 1 of 25 People Poised to Scale Atlanta’s Growing Technology Start Up Ecosystem for Black Americans and Beyond. I serve as a board member of the Technology Association of Georgia’s corporate development society, Founder and Board Chair of Minority Access to Capital, Inc., a non-profit dedicated to educating and empowering minorities on how to access capital to grow their business and create generational wealth and I have been elected to the Georgia House of Representatives since 2010, serving over 54,000 Georgians in DeKalb and Gwinnett Counties each year at the State Capitol. Intro: Let me get some things out the way…..
Ahem. So the featured picture in this blog post may have you going “wha….” as it seems counter to the title of this blog post. First, let me give some photo identifications to this fabulous group of people then I will explain. Going from left to right: Rep. Doreen Carter (Treasurer of Georgia Legislative Black Caucus), Bernie Dixon (President of Atlanta Tech Angels), Dana Ugwonali (President of Black Tech Foundation), Stephen Hassett (Chair of the TAG Corporate Development Society), Chrissa McFarlane (CEO of Patientory), Allyson Eman (Executive Director of Venture Atlanta), yours truly and Mrs. Jennifer Callender, (Vice President of Membership of Minority Access To Capital, Inc.) Lots of women. Lots of people of color. I smiled a lot that day. So what’s up with the photo? To provide some clarity, this was a joint event held at the Georgia World Congress Center between the Technology Association of Georgia’s Corporate Development Board (where I serve on the board), my non-profit Minority Access to Capital, Inc. (where I am Founder and Board Chair) and the Georgia Legislative Black Caucus (where I serve as Chair of the Economic Development committee). It was a wonderful event focused on “Capital Raising & Growth Strategies for Women and Minority Owned Companies”—-so the marketing targeted…you guessed it…women and minority owned companies. So it’s not surprising that we had a room full of black people (let’s be honest) and women. But this focused event is the EXCEPTION to the rule and frankly, I’m tired of it. “Dar’shun, what exactly are you tired of?” Answer: Being the only black woman in a room when money is being discussed at non-targeted events. That’s right—I said it. I went to an event to bring an international angel investor group to Georgia at the beginning of August. I was the only black woman out of about 100 people that attended this presentation. I also attended an event just last Friday on corporate venture capital funding with some of Atlanta’s top corporate leaders in venture capital. It was probably 150 people in the room at the Commerce Club BUT, low and behold, I was the only black woman. As many of you know, my outlet for venting my frustration is Facebook so I posted these (see below) at the time of both events….and yall, I am tired of making these same posts because this is NOT the first time I have made similar posts. Now I did NOT write this blog post to point blame at anyone or any organization for this too often recurring situation that I find myself. However, I am placing blame on myself and holding myself responsible for making sure this happens as less as possible in the future. I tried my best to reach out to a diverse group of people to attend both events but I MUST DO MORE if I want to see black women at these events. Therefore, I am personally pledging to pick up the phone and personally invite black women. I am personally pledging to send as many follow up emails as necessary. And I am personally pledging to even pick my sister girls up on my way to the same event. I have never been one to complain about a situation and expect others to solve it. I must do more and I will do more. I serve on a volunteer board of the largest tech organization in the southeast, the Technology Association of Georgia. There is no reason why I should be the only black woman “in the room” and “at the table”. I need to invite others that look like me to enjoy the meal as well. It is 2017. We can go where we please so we need to show up! This is not an exclusive offer. What I mean is that just because I am trying to get more black women to join me at certain non-targeted events doesn’t mean they cannot attend or shouldn’t continue to attend more targeted events. We are women—we can walk and chew gum at the same time. Optics matters. Ever heard the phrase “perception is reality.”? Well, it’s true in business and true in life. ALL presenters at both of the aforementioned events were white males, except 1 male at the corporate venture capital event. I am CONVINCED that there would be a different group of panelists and a more diverse discussion if black women had a significant presence in the room. And there you have it. I have put out what I will personally do the next time I am invited to a “non-targeted” event that I think should have the presence of black women to contribute to the discussion and the optics. I ask that each of you hold me accountable. Make sure that I do what I say I will do. It’s important, especially in these perilous times in the United States, that a diverse group of people talk with each other, respect each other and interact with each other in the same room. I hope you will join me in lighting up any room with a variety of colors and perspectives. November 8th– 1st EVER Georgia Blacks in Tech Policy Conference. Registration opens Sept. 1st. Sign up for my enewsletter to receive early registration link. Outstanding RFP– Looking for an organization with strong corporate ties to develop a program to train and expose minorities and women to PAID corporate board positions. More information HERE. I am Chief Diversity Activist and Consultant of Kendrick Advisory & Advocacy Group, LLC. We curate and execute customized initiatives, programs and events for organizations to meet their specific diversity & inclusion objectives and provide results. I practiced private securities law for over a decade before this transition to more meaningful work. I was featured in the Huffington Post as 1 of 25 People Poised to Scale Atlanta’s Growing Technology Start Up Ecosystem for Black Americans and Beyond. I serve as a board member of the Technology Association of Georgia’s corporate development society founder and Board Chair of Minority Access to Capital, Inc., a non-profit dedicated to educating and empowering minorities on how to access capital to grow their business and create generational wealth. 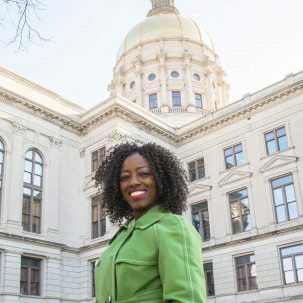 I have been elected to the Georgia House of Representatives since 2010, serving over 54,000 Georgians in DeKalb and Gwinnett counties under the Georgia State Capitol each year.